2017 Toyota Yaris - What's New? The 2017 Toyota Yaris in Richardson returns to our dealership with several notable enhancements. Among them is the new Toyota Safety Sense package which includes various safety features that are designed to help keep you safer on the road: automatic high-beam control, lane departure warning and forward collision warning with automatic emergency braking. 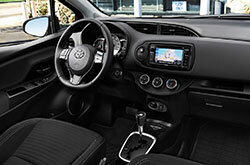 These top-notch systems now come standard on all Yaris models. 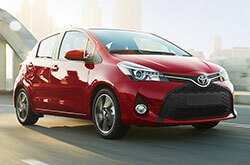 In addition, the Yaris also gets a new model - the iA. Formerly known as the Scion iA, the four-door sedan stands apart from the other Yaris trims, which are all hatchbacks offered in two- or four-door configurations. Keep reading our 2017 Toyota Yaris review to learn even more about this best-seller. The Yaris iA, L, LE and SE trims get fitted with standards like 16-inch alloys, keyless entry and ignition, tilt/telescoping steering, and 60/40-split folding rear seats that make unloading and loading easy. Staying entertained during your drives is easy in the Yaris, thanks to its 7.1-inch touchscreen, USB port, Bluetooth connectivity, voice recognition and six-speaker sound system. The SE trim will get you leather-wrapped steering and LED running lights. A 1.5-liter four-cylinder engine that makes 106 pound-feet of torque and 103 pound-feet of torque moves the 2017 Toyota Yaris in Richardson forward. 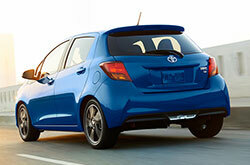 Every Yaris gets a standard six-speed manual that sends power to the vehicle's front wheels. An automatic transmission can be had for an additional cost. 2017 Toyota Yaris reviews praise the vehicle's top-notch safety standards that now include Toyota's Safety Sense package. It comes with automatic high-beam control, lane departure warning and forward collision warning with automatic emergency braking. 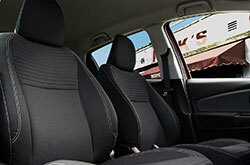 There are also antilock brakes, front-seat side airbags and full-length side curtain airbags. Traction and stability control have also been fitted to every model for enhanced safety. If you've been in the market for vehicles like the 2017 Ford Fiesta, Honda Fit, Chevrolet Sonic and the Hyundai Accent near Richardson, you should consider the 2017 Toyota Yaris. It could be a terrific match for you, due to its first-class cabin features and fun-loving persona. After you finish our 2017 Toyota Yaris review and try out the comparison tool, view factory incentives offered at Toyota of Richardson. 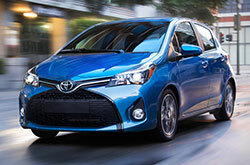 Desire a Toyota Yaris and looking for current finance offers? Then make a note to visit us right away! We hope the specs in our 2017 Toyota Yaris review will be beneficial when you make your eventual purchase decision. Get all set to be in awe with the stately Toyota Yaris for sale at Toyota of Richardson in Richardson, TX. Email to schedule an appointment for a test spin. If you're eager to see it prior to your visit, view its exterior design and see how it's furnished in the included video.